Sambar (Rusa unicolor) complete detail. 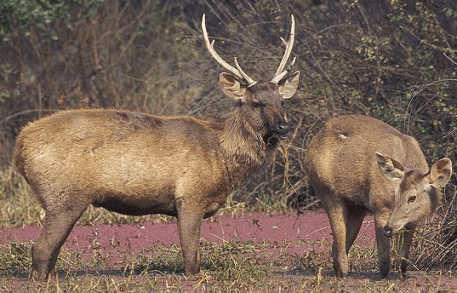 Description of Sambar – Rusa unicolor – Sambar deer. Classification of Sambar (Rusa unicolor). Habit and habitat of Sambar. Distribution of Sambar. They prefer forest, marshy and wooded areas. They also found in tropical dry forests, seasonal moist evergreen forests, subtropical mixed forests and tropical rain forests. The weight of adult Sambar is between 100 to 320 kg. Head to body length measures about 150 to 270 cm. The length of tail about 15 to 30 cm. They are about 100 to 150 cm high at the shoulder. 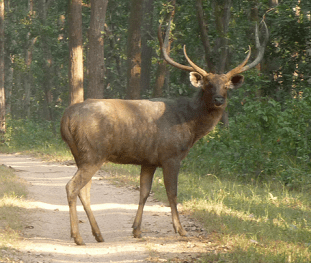 Male sambar has unique stout and rugged antlers. They are fairly shy and nocturnal in nature. Their breeding period is mainly during the months of November and December. In this period, male deer guard their rutting territories and try to attract the female deer through vocal and olfactory displays. The male often sprays his body with urine and, standing erect on his hind legs, rubs his odour on trees. Due to regular wallowing in wet spots, the male is usually covered with mud, accentuating his dark fur, and he often acts aggressively during this time. Courtship is based more on tending bonds rather than males vocally advertising themselves. At the time of mounting, males do not clasp females. 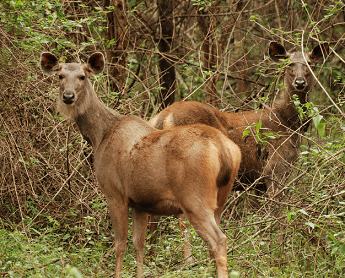 Sambar is a Schedule – III animal, according to wildlife (Protection) act, 1972 and classified as Vulnerable (VU) by the IUCN. The weight of adult Sambar is between 100 to 320 kg. Head to body length measures about 150 to 270 cm. The length of tail about 15 to 30 cm. They are about 100 to 150 cm high at the shoulder. The color of body is dark or light brown with a yellowish or greyish tinge. The under parts are paler in color. 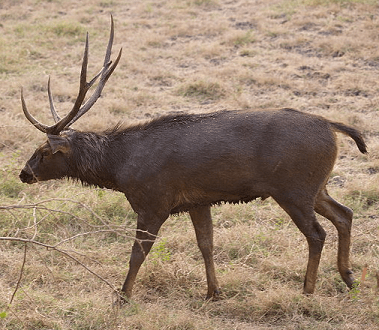 Old Sambar’s tend to become very dark brown, almost black. They have a coarse coat of short, dark hair with lighter brown to creamy white hair on their undersides. The hairy coat is generally consistent in color around the body, but can vary from yellowish-brown to almost dark grey. 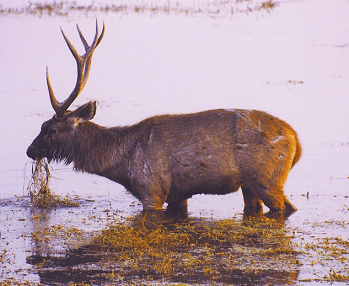 Male sambar has unique stout and rugged antlers. The antlers are typically up to 110 cm long in adult individuals. These antlers have three points, or tines. The tail is relatively long for deer (15 to 30 cm), and is generally black above with a whitish or dirty white underside. The brown tine is set at an acute angle with the beam. The beam forks into two nearly equal tines. In some heads the outer, in other the inner, tine is longer. The full number of points are developed in the fourth year. The legs are long and strong, the upper color of legs is dark brown and the inner parts of legs are light paler or dirty white in color. Ears are long, and brownish grey in color. They have a small but dense mane, which tends to be more prominent in males. Males tends to be heavier and is likely to be darker than the females. Adult males and pregnant or lactating females possess an unusual hairless, blood-red spot located about halfway down the underside of their throats. This sometimes oozes a white liquid, and is apparently glandular in nature. Conservational Status – Schedule – III, according to wildlife (Protection) act, 1972 and classified as Vulnerable (VU) by the IUCN. They found in India, Sri Lanka, Pakistan, Nepal, Thailand, Cambodia, throughout southern China, Southeast Asia (Burma, Indochina, and the Malay Peninsula), Taiwan and the islands of Sumatra and Borneo. 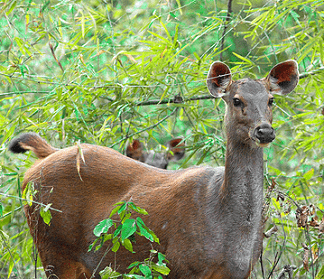 The sambar deer has also been widely introduced outside its native range, in places such as South Africa and Australia. In India, they can easily be spotted at some protected areas like Kanha, Corbett, Ranthambhore, Bandhavgarh, Gir, Dudhwa, Manas, Kaziranga and Sariska. They prefer forest, marshy and wooded areas. They also found in tropical dry forests, seasonal moist evergreen forests, subtropical mixed forests and tropical rain forests. They commonly found near water, where it can forage for water plants. They like the dense cover of deciduous shrubs and grasses. They have excellent senses of hearing and smell which are used mainly for detection of predators. They are fairly shy and nocturnal in nature and mainly active at twilight or at night. Sambar is very alert and silent, and will freeze instantly if disturbed. At the time of danger a sambar will stamp its feet and make a ringing call known as “pooking” or “belling”. 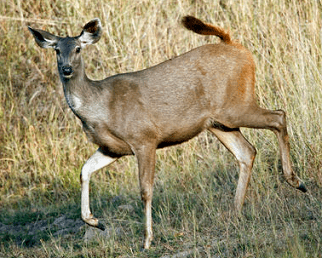 Sambar is a herbivores animal. They feed on various types of grasses, foliage, fruits, Water plants, leaves, herbs, buds, bamboo, bark, stems, and berries. They also consume a great variety of shrubs and trees. The males live alone for much of the year, and the females usually occur in small groups, which are often dominated by a single female. Young males group together close to females, while males over six years of age are typically solitary. They often congregate near water, and are good swimmers. They can easily swim with its body fully submerged and only its head above water. The age of sexual maturity is between 22 to 24 months. They reproduces year-round, but breeding usually peaks seasonally. Their breeding period is mainly during the months of November and December. In this period, male deer guard their rutting territories and try to attract the female deer through vocal and olfactory displays. The male often sprays his body with urine and, standing erect on his hind legs, rubs his odour on trees. Due to regular wallowing in wet spots, the male is usually covered with mud, accentuating his dark fur, and he often acts aggressively during this time. Courtship is based more on tending bonds rather than males vocally advertising themselves. At the time of mounting, males do not clasp females. The front legs of the male hang loosely and intromission takes the form of a “Copulatory jump”. Females usually gives birth to a single calf after a gestation period of about 8 to 9 months. The young begin to take solid food at 5 to 14 days, and begin to ruminate after 27 to 35 days. The average lifespan of sambar is between 16 to 20 years.